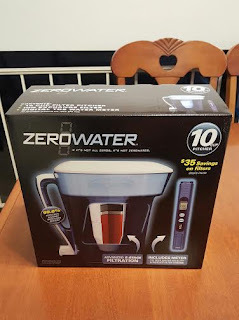 Thanks to ZeroWater, I got to review one of their amazing products. I am really excited to tell you all about it! Enjoy pure-tasting water with the latest filter pitcher technology. The ZeroWater filtration system combines FIVE sophisticated technologies that work together to remove virtually all dissolved solids from your tap water, delivering you great tasting water. This 10-cup system comes with, our patented Ion Exchange filter, a laboratory-grade water testing meter and a guarantee to remove virtually all dissolved solids from your tap water. I love that it features a 10-cup reservoir! We drink a lot of water and it is the perfect size for us. The spout is great and makes it so easy to fill any bottle or cup. Another thing that is awesome, the convenient space-saving design. The built -in TDS meter holder is also impressive. Blue was a brilliant color to pick, my personal favorite. My family gives our new ZeroWater 10-cup pitcher a thumbs up! The water tastes so fresh and yummy out of it. Need a gift idea that would be useful that everyone will love? You found it! We have a wedding coming up soon and plan on ordering one for that. We will also include a set of extra filters to go with it. What a superb Christmas or anytime gift this would make as well! Thank you so very much ZeroWater for the amazing products and customer service! Just what I need, love it! Awesome! My wife Mindy that just left a comment above, sent me a link to this review and asked me to check it out and order her one for Christmas. Thanks for this review, it helped me with a gift idea for my super picky wife that is extremely hard to buy for. I had another brand and did not like it, this one sounds good I will have to try it.